We no longer have any Mulefoot Hogs. Business was so good, we sold completely out. If you are interested in raising these endangered animals, contact the MuleFoot Hog Association or one of the people whose numbers I have listed below. I am leaving this page up for informational purposes. Thanks for all the interest you've shown. I have a limited supply of my original "Pecked To Death By Ducks" Salve. It is great for Poison Ivy, Oak, Cuts, Burns, Psoriasis, Abcesses, Chapped Skin and just about any other skin condition. I also have customers who use this salve on their animals. Hundreds of people swear by it and it is getting hard for me to make enough to last the whole year. I gather all the herbs on my own land and cook the salve for a full moon cycle as did my Ancestors before me. To order a 2 oz jar, send $5.00 + $3.00 P&H to Susan Bates, HC 73 Box 159-1, Drury MO 65638 For each additional jar add $1.00 more for postage to the total. Thus 2 jars would be $10.00 plus $4.00 P&H. The FDA requires that I tell you: "These statements have not been evaluated by the Food and Drug Administration. These products are not intended to diagnose, treat, cure, or prevent any disease." You are fully responsible for the results you experience from using these herbs. 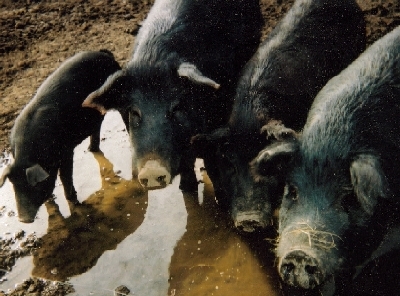 The American Mulefoot Hog is truly one of the most unique breeds of swine in the world. Once almost extinct, it is making a comeback today. Known for it's solid hoof which resembles that of a mule, they are gentle animals and remarkably hearty. Their coats are soft, mainly black with occasional animals having white points. They are easy to raise and may weigh between 400 and 600 pounds by the age of two. This is the old fashioned ham hog that your grandparents thrived on and one that is worthy to bring back to the table! Here on Water Hollow Farms, our hogs are fed only the highest quality feed and purest spring water which flows directly from these Ozark Hills. On the verge of extinction, these hogs were rescued by Mr. R. M. Holliday of Louisiana, Missouri in 1964. He lovingly raised them and encouraged others to as well. Our stock came directly from Mr. Holliday's farm in Louisiana. While the Mulefoot hog population is still classified as critical by the American Livestock Breeds Conservancy, they are making a comeback. If you would like more information about these wonderful animals or would like a list of the stock we have for sale, feel free to contact us. 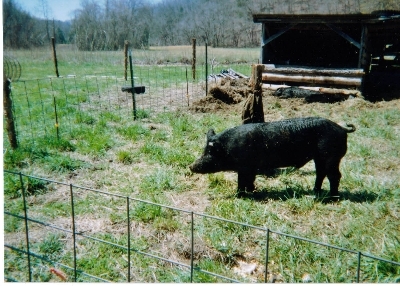 Amos - Our Registered Boar! 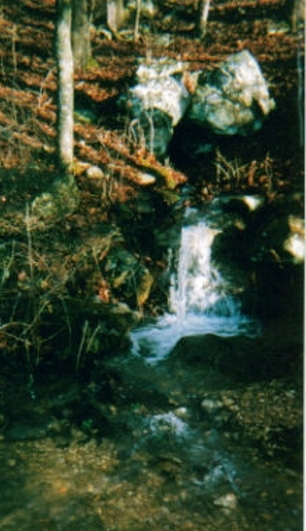 The Spring on Water Hollow Farm.